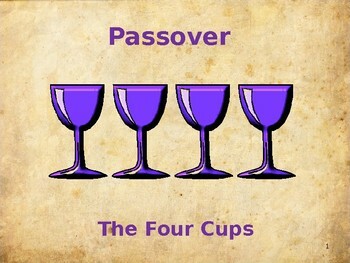 The four cups of Passover were added to the Passover Seder between the time of Ezra and the destruction of the Temple in 70ce. They are connected to the Bible passage found in Exodus 6:6-7. 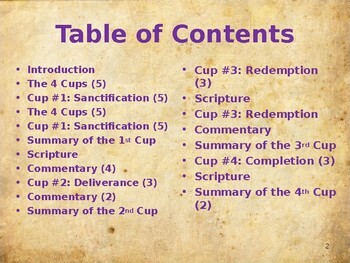 This 38 slide presentation gives the purpose of each individual cup, connects that cup to its past, and then applies the cup to the future of today. This study can be taught on the high school or college level. Each cup breaks down into an understandable format, presented in bullet form and is designed to produce discussion. 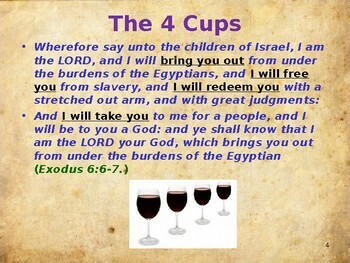 Where, in the Passover Seder, are the cups drank? 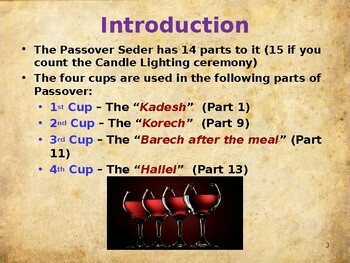 What are the purposes of the four cups of Passover? How does each cup relate to the Past? How does each cup connect to your future?